In addition to some of our recent changes, we plan to have guest bloggers periodically, to, you know, mix it up a bit! Our first guest blogger is Chef Lise Jaeger, great friend, awesome chef, excellent teacher, and owner of Chef For Hire, LLC. Thanks, Lise, for sharing your recipe for this soup, which, by the way, totally rocks. I called Amy and Chris on the off chance they would be free on a Saturday night (let me tell you folks, they are hard to pin down sometimes!!). Luck would have it that they indeed wanted to brave the winter chill and the threat of snow to come to my house for some soup and a bonfire. Hurray!! 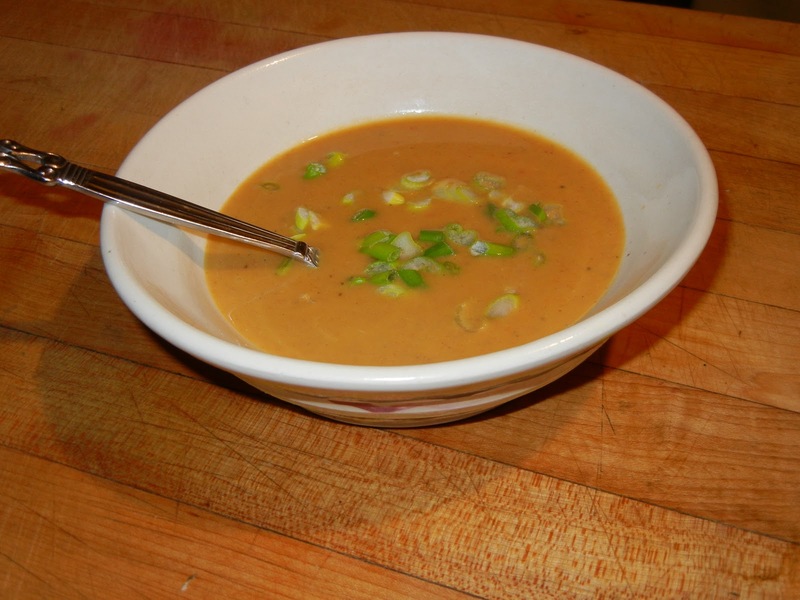 I have made this soup several times in many variations with different spices and different nut butters. So you can play with this to suit you own buds. This warm and creamy soup with a bit of Asian accents was a hit with my guests. Now we just have to get Amy some real snow boots. In large soup pot, on medium high heat, heat the oil and saute the onions, carrots, garlic and ginger until the onions are translucent. Add squash and saute for 5 minutes. Add cinnamon, five spice powder, salt and cayenne, and stir until vegetable are coated. Add coconut milk and vegetable stock and bring to a boil. Reduce heat and simmer till the squash is very soft. With a hand blender or food processor, puree soup until smooth. If it is too thick, add water to arrive at desired consistency. Add agave syrup and peanut butter, and blend until fully incorporated. Adjust the seasoning to your liking. Sprinkle with green onions, or chives for a garnish. Serves eight. Enjoy!!! Note: This soup also freezes very well! Wow, those are some amazing flavors! This sounds really good! Thank you, Chef, for sharing. It sounds like delicious soup! Great ingre. for sure..I would say compliment each other very well! Great guest post! Nice idea to have guest posts. The soup sounds delicious. As soon as I saw Chinese Five Spice you had me. Definitely going to make this on the weekend. NOT THE JAEGER I WAS LOOKING FOR. where is my peanut butter jaeger drink? i triple dog dare you to create one.